After weeks of growth, devastating loss, record heat and high winds, firefighters have made huge strides in the High Park Fire battle. The second largest fire in state history, as well as the second most destructive (Waldo Canyon fire burning near Colorado Springs became the most destructive fire in state history on June 28), experienced little to no growth on Wednesday -- even on the eighth day of Red Flag Warnings indicating high fire growth potential. Containment is now at 75 percent -- the highest percentage to date and after a setback last week, when containment had fallen from 60 percent to 45 percent. The U.S Forest Service also announced that fire crews are officially now in a "mop up" stage of the fire that has burned a total of 87,284 acres, according to The Denver Post. This follows a Wednesday announcement that the majority of residents who were evacuated from the region should be able to return to their homes by week's end. As the firefighters increase containment of High Park Fire, they plan on sharing their resources with the other multiple fires burning along the Front Range. "We are going to help those folks out," Incident Commander Beth Lund said about coordinating the most effective use of fire resources. However, the High Park Fire still has a long way to go and firefighters will continue to be aggressive with the blaze. "We will have the necessary retardant capability and aircraft to manage flare-ups," Air Operations Director Hugh Carson said. "We will continue to have dawn-to-dusk aircraft coverage over the incident." 1,313 firefighters continue to battle the blaze, a large number to be sure, but down from over 2,000 on Monday. 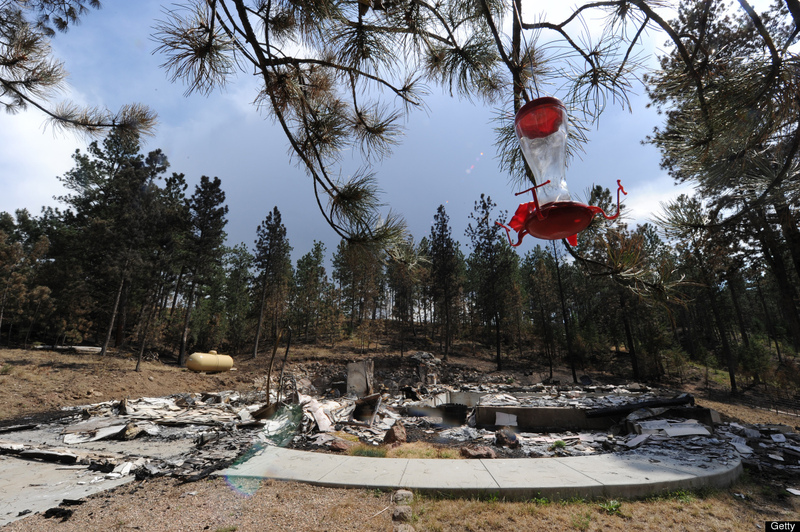 The High Park Fire burned an additional 57 homes last week, bringing the total number of homes destroyed to 257. Authorities expect that number to grow after further assessment of the burned-out area is complete. Reporters were recently given a tour of a burnt out community along Larimer County Road 29C, Missile Silo Road. 9News' Kevin Torres spoke with firefighters in the area who spoke about the devastation and the time it will take for the area to recover -- at least a generation, firefighters said. Patrick Love of the Poudre Fire Authority told Torres, "Most of us will be dead before things look the way they used to." Burning since June 9 after lightning struck a tree on private land and now on its 19th day, firefighters battle the wildfire with the help of 7 helicopters, 103 fire engines and 11 dozers. The cost of the fire to date is $33.5 million. A radiometric imaging system -- called the Radiometric Airborne Mapping System (RAMS) -- which provides real time GPS coordinates for areas of identified heat, and heat sources (open flame, smoldering, buried or diminishing heat) arrived over the weekend and fire officials plan on attaching it to the bottom of a helicopter to scan the fire area and help determine where to focus their efforts. The massive fire has now burned approximately 136-square-miles -- to put this size into perspective, that's approximately the same size as the cities of Boulder, Broomfield and Fort Collins, Colorado combined. Days of record heat produced a surge of new fires burning throughout Colorado and also provided fuel and devastating growth conditions for the fires already burning. A total of ten major fires were burning over last weekend, all part of the worst wildfire season in a decade. Shorline Drive is also under a pre-evacuation. All residents previously evacuated are also still on a pre-evacuation alert. Mandatory evacuation orders were issued on 6/17 for residents of Glacier View filing 12. County Road 44H (Buckhorn Road) from County Road 27 to Pennock Pass and residents to the south approximately 3/4 - 1 mile. Buckhorn Road up to the Stove Prairie School. Poudre Canyon from Mishawaka to Rustic. The area between CR 27E and Stove Prairie Road and south through the entire Rist Canyon area including Davis Ranch Road and Whale Rock Road. South on County Road 44H 3 miles to just north of Stringtown Gulch Road, Paradise Park Road, Moose Horn Lane, Magic Lane and Spencer Mountain Road. Old Flowers Road from Stove Prairie Road to the 8000-block of Old Flowers Road. Stove Prairie Road north along County Road 27 to Highway 14, east along Highway 14 to approximately mile marker 111, southeast to Rist Canyon Fire Station 1, then back west to to include Wilderness Ridge Way, Rist Creek Road, Spring Valley Road and County Road 41 and all of the roads that run off it. For official fire maps and live updates from the ground of the many Colorado wildfires currently burning, visit InciWeb.org. Residents who live in areas where property damage has occurred can call 970-619-4086 to find out the status of their home.